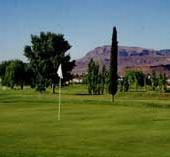 Recommended muni golf in Kingman: Cerbat Cliffs G.C. Cerbat Cliffs G.C. is set among tufa stone bluffs and bracketed by terra cotta plateaus. KINGMAN, Ariz. -- The likelihood is that Bobby Troup didn't have golf on his mind when he penned the lyrics to that famous paean to motoring through the West. Nevertheless, get hip to this timely tip: In Kingman, only a couple of miles west of that historic motorway, you will discover Cerbat Cliffs Golf Course, a municipal course that provides a beautiful natural setting, friendly atmosphere and outstanding greens, all while remaining pleasingly affordable. Cerbat Cliffs G.C. is set among tufa stone bluffs and bracketed by the terra cotta plateaus of this high desert city. At around 3,300 ft. above sea level, Kingman is typically 10 degrees cooler than elsewhere in the state, so chaparral and desert willows take the place of saguaro cacti, and a round of golf proves comfortable year-round. Formerly a sand course, Cerbat first "got grass" in 1973 as a nine-hole layout, which was expanded to eighteen in 1996 by Bill Phillips. Those familiar with some of the Southwest's top courses may discern similarities between Cerbat and one of the country's great golf bargains, New Mexico's Pinon Hills. The most pleasing similarity between the two tracks in the price of admission: the top rate at Cerbat Cliffs, for a weekend morning round, is a mere thirty bucks. Cerbat's phenomenal bent grass greens are among the best in the country for a city-owned facility, and are unsurpassed even by some of Arizona's most celebrated courses. Those who tee it up at Cerbat Cliffs may feel like they stole something at the end of their round; it's that good a deal. If you're on the lookout for great golf on the cheap, you can surely get your kicks down at Cerbat Cliffs. Be prepared for a few different looks when you first take on Cerbat Cliffs. The layout changes character so often you'd swear it needs therapy. The first five holes are all shortish, photogenic par fours, characterized by the wind-worn mesas which border them. Cerbat morphs into a serene, parkland layout during holes six through eleven, where water and bunkering become key considerations. Holes twelve through fourteen run along the southern flank of I-40, and are often at the mercy of strong afternoon winds which whip fiercely through the wide-open terrain. The final three holes make up the notorious "Lava Loop". "This is our little version of Amen Corner," says Head Professional Paul Mowry. Separated from the remainder of the course by Gates Ave., the Lava Loop is festooned with volcanic residue and desert scrub. Conquering this hellacious circuit requires pinpoint accuracy and more than a little luck. In fact, some locals terminate their round at the benign par-5 15th rather than continue onto the Lava Loop, and first timers to the course will no doubt discover why. Howling wind, blind shots, and nasty, ridged greens can maul what may heretofore have been a respectable scorecard. Only the foolhardy will press their bets on this closing troika. Tufa stone formations form a ringlet around this short par three, including one monolith which guards the front of a deep green. As you putt out, look back towards the tee to catch a glimpse of Mt. Hualpai astride the northern horizon. You can also admire the original clubhouse (constructed from native tufa stone and now a private residence) which overlooks the hole. Key Hole No. 9 Par 5 508/475/431/388 yds. HCP: 9/5 There is a good deal of potential trouble on this short par five. From the tips, you must fly your drive over the top of (or shape a fade around), a tall desert willow. Too far right and your ball may find a series of ponds. Yank your tee shot left and you'll be stymied by a tufa stone barricade. Find the fairway, however, and you'll have a shot at reaching a generous but well-protected green in two. Card Wrecker No. 16 Par 4 338/330/303/255 yds. HCP: 4/6 Welcome to the beginning of the "Lava Loop". I'm sure locals secretly snicker at first-timers trying to figure out how to play this sharp dogleg left hole. Hitting a fairway metal or long iron into the visible landing area is your best bet. However, the yardage remaining to the flag will likely be the most grudging of the day. Playing directly into a wall of wind, your approach must carry a dry creekbed to find a maddeningly wee target. Set upon an narrow plateau, this hellacious, multi-tiered green is as difficult to read as War and Peace -- in Cyrillic. Course's Best No. 18 Par 4 440/435/418/364 yds. HCP: 8/10 The eighteenth at Cerbat Cliffs was originally designed as a slightly longer and fairly easy par five. However, complaints from a homeowner who's adjacent property was getting barraged with errant banana balls forced a modification, which turned out to be for the better. This closing hole is now a tough par four, playing downwind but requiring length and accuracy off the tee, as desert wastes infringe upon the margins of a tight fairway. Your final approach requires a thrilling carry over the desert chaparral to a wide but shallow target. Boldness here is occasionally rewarded with a closing birdie. So, "If you ever plan to motor west..." -- or from any other point on the compass -- you may want to forget Winona, or Barstow, or San Bernadino; just don't forget to stop in Kingman and play Cerbat Cliffs. It's a timely tip you can count on. Guy Torrey is the author of "The Straight Ball Guide: Nevada Golf."